If you’ve stitched a few of my BrightSea Village designs I’m sure you’ll agree with me that the roofs are the most arduous parts to stitch. When I design these I agonize over what and how much I can put on the roof without it starting to look ridiculous. We’ve had butterflies, birds, balloons, balls, a bell . . .. (I could go on, but I’ll just stick to things beginning with “B” for now.) If anyone has any suggestions for what else I could put up there to make the stitching a little more exciting – please – I’d love to hear your suggestions. Here’s how I get thorough the boring bits. 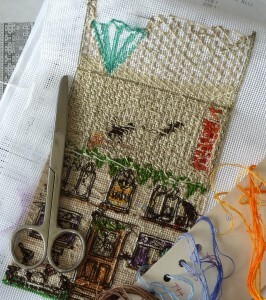 I stitch one length of thread on the roof and the next length somewhere else in turns until I’m finished the roof. There are a few interesting bits on the roof of my current project (which, at four weeks along, I’m still being a bit secretive about). In fact there are two new “B” items on this roof. This time I’m showing you the back view (not so pretty) so as not to give away too much. This entry was posted in BrightSea Village on February 5, 2015 by Elli Jenks.